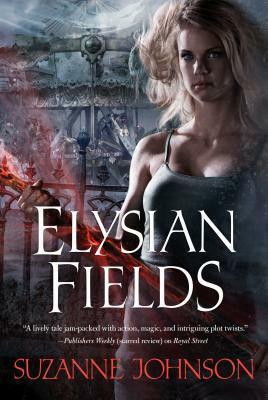 "Elysian Fields" by Suzanne Johnson is the fun, fast-paced third book in the Sentinels of New Orleans, a series of urban fantasy novels filled with wizards, mermen, and pirates. These novels are perfect for readers of paranormal fiction and "fans of Charlaine Harris and Cat Adams" ("Booklist) "and "RT Bookreviews" agrees that "for readers missing Sookie Stackhouse, this series may be right up your alley. "The mer feud has been settled, but life in South Louisiana still has more twists and turns than the muddy Mississippi. New Orleanians are under attack from a copycat killer mimicking the crimes of a 1918 serial murderer known as the Axeman of New Orleans. Thanks to a tip from the undead pirate Jean Lafitte, DJ Jaco knows the attacks aren't random an unknown necromancer has resurrected the original Axeman of New Orleans, and his ultimate target is a certain blonde wizard. Namely, DJ.Combating an undead serial killer as troubles pile up around her isn't easy. Jake Warin's loup-garou nature is spiraling downward, enigmatic neighbor Quince Randolph is acting weirder than ever, the Elders are insisting on lessons in elven magic from the world's most annoying wizard, and former partner Alex Warin just turned up on DJ's to-do list. Not to mention big maneuvers are afoot in the halls of preternatural power.Suddenly, moving to the Beyond as Jean Lafitte's pirate wench could be DJ's best option." Solid plotting and a well-described, consistent setting make this a strong and intriguing addition to the genre. "Publishers Weekly on River Road" [Johnson] does a brilliant job of bringing her fantasy version of New Orleans to life. An enchanting examination of magic and the people who wield it, "River Road" is a book to be savored. This second novel in the Sentinels of New Orleans series is a page-turner all by itself, but don't cheat yourself by missing out on "Royal Street," its predecessor. "RT Book Reviews, on River Road" A vivid debut. . . . Sympathetic, entertaining DJ is the perfect narrator. "Publishers Weekly, starred review, on River Road" A resourceful heroine who relies on her magical ingenuity. . . . The author captures Katrina's devastation and the long recovery of a city's resilient people. "Library Journal, starred review on Royal Street" Suggest this fast, fun, and engaging fantasy-thriller to fans of Charlaine Harris and Cat Adams. "Booklist on Royal Street" Deft humor, creative plot twists, sure-footed use of language and quirky characters. . . . Likely to remind readers of Charlaine Harris's fun "True Blood." "New Orleans Times-Picayune on Royal Street" Unplug the phone. Turn off the TV. You won't want to be interrupted. I read it in one sitting. A thoroughly enjoyable world and a likeable heroine make for a fun read. "Cat Adams, author of Siren Song, on Royal Street""